Chuhai (チューハイ or 酎ハイ, Chuhai? 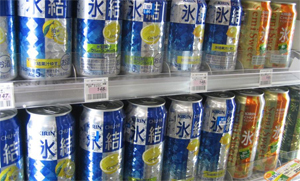 ), sometimes sold as chuhi, is an alcoholic drink originating from Japan. The name is derived from “shōchū highball” and is usually flavored with fruit or soda. Think candy soda with alcohol in it. Coming in flavors such as lime, grapefruit, apple, orange, pineapple, grape, kiwi, ume (plum), yuzu (a citrus fruit), peach, and personal favorite, Ramune, the drink usually when served at a bar is low in alcohol. But in the can it can go up to as high as 7% (14 proof). Meaning that while you thought you were a big boy drinking beer, the Chu-Hi dude is getting ripped twice as fast. Many a night were obliterated thanks to the wonder that is Chu-Hi. Do you know whether or not Shinzo Abe resigned? What is the current standing of the Chunichi Dragons in J-Baseball? If you for some reason keep up with all this and actually can read Japanese, then you have some awesome trivia fun in store for you. 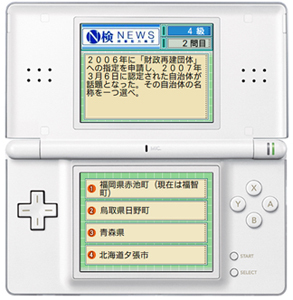 Mainichi in conjunction with Nintendo has come up with a virtual DS on which you can test your trivia knowledge about current Japanese news events. Now I am not going to lie, even if you can read Japanese this will be hard. Not everyone is privy to the current social events of Japanese society, politics, and sports on a daily basis. Hence horrible stereotypes. But don’t worry as the paper reported yesterday, the Godzilla attacks of October are finally dying down thanks to Mothra.